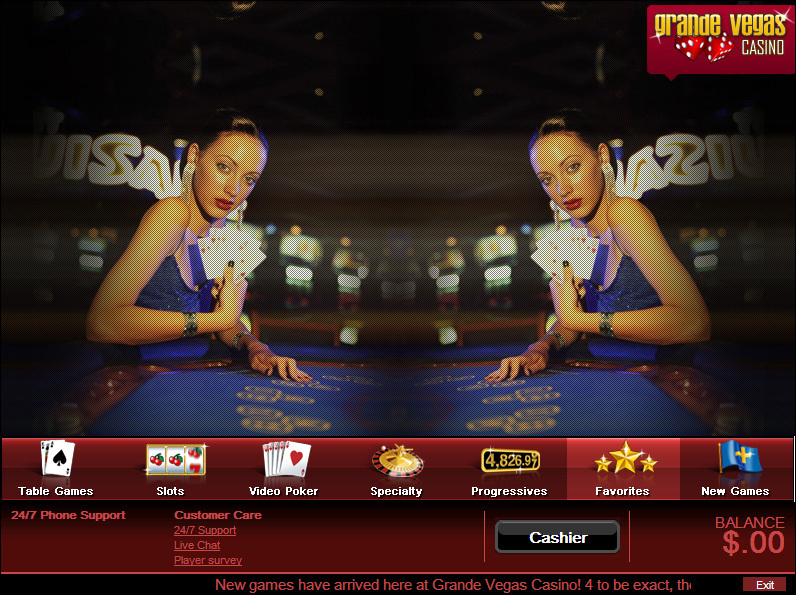 The English and French language Grande Vegas Casino has been around since 2009, and this Costa Rican licensed casino site offers a simple, easy to manage style of casino gaming at their domain. 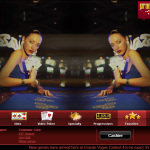 Grande Vegas is available in downloadable, instant play, or mobile platforms, with players able to play a host of RTG (RealTime Gaming) games at their site. 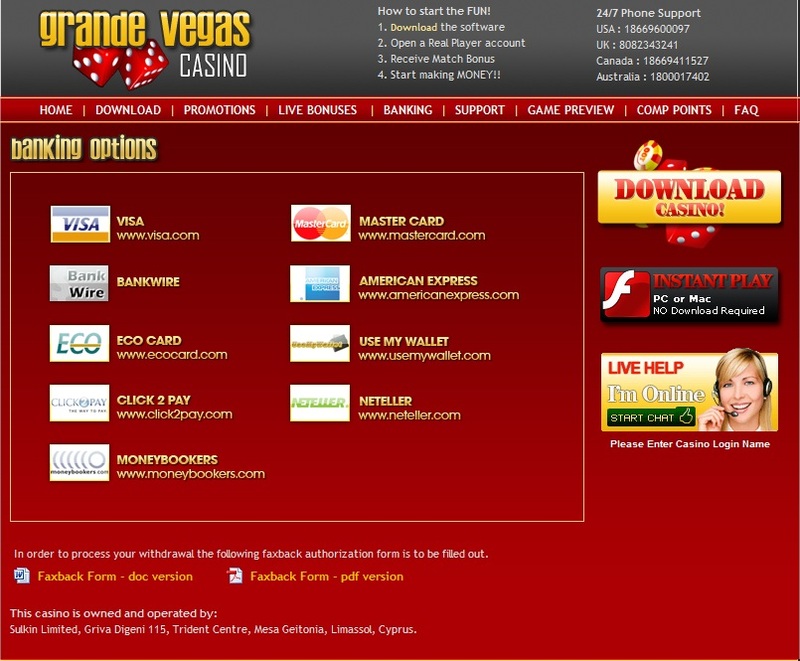 Grande Vegas Casino has been designed to accept US dollars as its currency option, but that shouldn’t be too much of a hindrance to players. Accepted deposit options include American Express, eCheck, ECO, InstaDebit, MasterCard, Paysafecard, Skrill, VISA, and wire transfers. If you seek support, you can obtain it via a toll-free telephone (for US players), toll-charged telephone (outside of the USA), live chat, Skype, or e-mail. 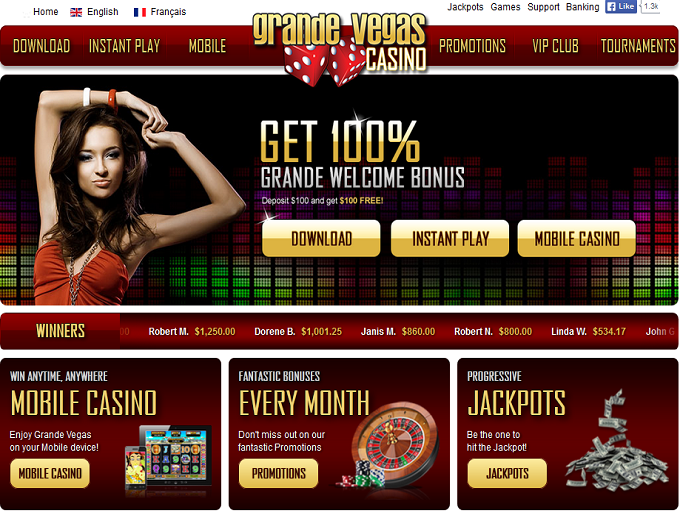 All new players are invited to claim a 100% match deposit bonus on the very first deposit they make at Grande Vegas Casino. This bonus is valid up to $100 and is triggered when players use the 100MATCH code. Enter the 150MATCH code on your second deposit, and you can claim a 150% match worth up to $150, and pocket 50 free spins on the Achilles slot. Lastly, players can enter the 50FREE code on their third deposit to claim $50 in free casino cash. As well as their selection of welcome bonus offers, players will also be invited to claim $200 worth of Grande Rewards, a lifestyle bonus, 25% cashback, $100 Happy Monday offers, mid-month deals, free money offers, and slot tournaments whilst playing at this online casino site. As we’ve said, the games at this online casino are provided by RTG. Players won’t find titles from other developers at the casino, but fortunately, RealTime Gaming have such a sizeable library that you can play any number of top games at this site. Games are divided up into table games, slots, video poker, speciality games, progressive jackpot games, favourites, new games, and live dealer casino titles. You can also check out your recently played games via the Last Played tab on the gaming menu. Slots themselves are broken down into 3-reel, 5-reel, and even 6-reel genres. The most popular games at this casino include Achilles, Aztec’s Treasure, Builder Beaver, Caesar’s Empire, Coyote Cash, Enchanted Garden, High Fashion, Lucha Libre, Eternal Love, Sweet 16, Voodoo Magic, The Nice List, Zhanshi and many more.